Whether you're shopping online for Rubbermaid storage bins, shelves, containers, tool boxes, or mobile work stations, you're sure to find just what you're looking for -- right here at Georgia Mills Direct's Rubbermaid Commercial Products.com! The Brute totes are a tough long lasting storage solution. Two sizes and colors to chose from. Also stack-able for a smaller footprint. 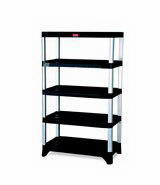 This shelving selection has wheeled and stationary models for permanent or mobile storage. Several models to choose from. 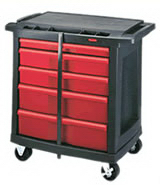 Need a mobile tool or item storage this section is for you. Trade carts for just about any industry or profession. Durable long lasting construction.